One might have thought that the resignation of a prime minister and his entire government would have merited at least a few words on the BBC News website, regardless of the location. However, when the Palestinian Authority prime minister handed in his resignation on January 29th, BBC audiences saw no coverage whatsoever of that story. “PA Prime Minister Rami Hamdallah and his government tendered their resignations earlier Tuesday, marking the end of a failed unity bid with rival Hamas. [PA president] Abbas accepted the resignations but assigned Hamdallah and his fellow ministers the task of maintaining the PA government’s operations until the formation of a new one, the official PA news site Wafa reported. 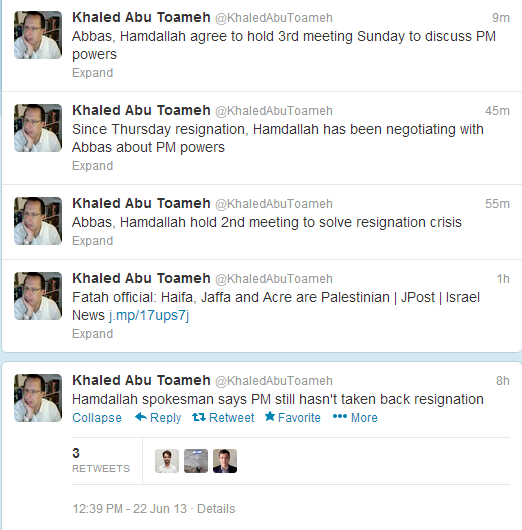 However, Khaled Abu Toameh reports that Fatah’s plans for a PLO government have already run into choppy waters. …the PLO’s Popular Front for the Liberation of Palestine (PFLP) and the Democratic Front for the Liberation of Palestine (DFLP) said that they will not be part of a government that “solidifies divisions among” the Palestinians. Meanwhile, The BBC’s ‘Palestinian territories’ profile (last updated in December 2017) and timeline still tell audiences that in October 2017 “a government of national unity assumed control of Gaza public institutions” and “Hamas lets the Ramallah-based unity government take over public institutions in Gaza as part of a reconciliation process between the two rival administrations”, despite the fact that those statements are patently inaccurate. “Palestinian Authority Prime Minister Rami Hamdallah survived an apparent assassination attempt when a bomb went off next to his convoy as he visited the Gaza Strip on Tuesday, wounding several people, officials and Palestinian media reported. According to the New York Times, Barhoum was in fact using Hamas’ default ‘explanation’ for just about everything that happens in the Gaza Strip. “The Hamas spokesman Fawzi Barhoum said, however, that Hamas had no role in the attack. He called the blast an attempt to “tamper with the security of the Gaza Strip” and to “strike any efforts to achieve unity and reconciliation,” and demanded an investigation. Mr. Barhoum instead sought to blame Israel: He suggested those responsible were “the same hands” who had gunned down Mazen Fakha, a Hamas official responsible for a number of terrorist attacks, in March 2017, and tried to kill Tawfiq Abu Naim, the head of Hamas’s security forces in Gaza, in October. “[Ismail] Haniyeh phoned Hamdallah after the explosion and the two agreed to “blame Israel and its collaborators” for being behind the explosion, according to a statement issued by the Hamas leader’s office. The BBC’s public purpose remit obliges it to “provide accurate and impartial news […] of the highest editorial standards so that all audiences can engage fully with issues across the UK and the world”. Does the corporation really consider that the uncritical repetition of unproven knee-jerk accusations from a terror organisation contributes to meeting that obligation? “He gave a two-hour speech and we have selected what we believe to be the relevant sections as far as the topic in hand is concerned. We don’t believe the rest of Mr Abbas’s comments are relevant, or reveal anything that was not previously known– our report contains a section entitled “Did he say anything new?”. “Obviously the BBC does not believe that – even at a time when the topic of foreign donations to the Palestinians is in the news – its audiences needed to know that Abbas pledged to continue the PA’s policy of making payments to convicted terrorists – a subject that it serially under-reports. Readers may be aware that around 7% of the PA’s annual budget is typically allotted to payments for terrorists and their families and that in 2017 – when the annual budget was $4.48 billion – the PA’s financial rewards for terrorism amounted to over $340 million. A bill relating to those PA payments to terrorists recently passed its first reading in the Knesset. “Fifty-two MKs supported the bill introduced by MK Elazar Stern (Yesh Atid) and a group of MKs, which would deduct welfare payments paid out by the Palestinian Authority to Palestinian prisoners and their relatives from tax revenues Israel transfers annually to the PA. Ten lawmakers voted against the legislation. The bill’s co-sponsor MK Avi Dichter noted that the PA’s 2018 budget would allocate even more money for terror rewards. Should a version of that bill eventually become law, BBC audiences can expect, as in the past, to see reporting on the withholding of tax revenues to the PA. However audiences will be highly unlikely to understand the background to such reports seeing as the corporation serially avoids providing any serious reporting on the issue. In one rare and brief mention of the topic last May, the BBC’s Middle East editor came up with a portrayal that is not only devoid of the word ‘terrorism’ but compares Israeli soldiers to convicted Palestinian terrorists. “In his opening remarks, Mr Netanyahu said that if the bomber in Manchester was Palestinian, and his victims were Israelis, the Palestinian Authority would be paying a stipend to his family. The only other mention of the issue in BBC News website reporting over the last year came in the form of a paraphrased quote from the US ambassador to Israel in which the BBC replaced the word ‘terrorists’ with ‘militants’. Obviously it is high time for BBC audiences to see some serious, accurate and impartial reporting on this topic. Listeners then heard two short ‘man in the street’ interviews. Bateman sidestepped the topic of the reasons behind the electricity crisis in Gaza, dismissing the subject as “complex”. He also failed to tell listeners why conditions in Gaza did not improve during the two weeks between the Hamas announcement that it would dissolve its managing committee in the Gaza Strip and the cabinet meeting that is the subject of his report. “Regarding the punitive measures Abbas levied against Gaza in April in order to force Hamas to cede control of the Strip, he [Abbas] said he was in “no hurry” to lift them. A statement from the US Middle East envoy put out the day before Bateman’s report made the US position clear. “The United States on Monday said it welcomes efforts for the Palestinian Authority to resume control over government institutions in the Gaza Strip after the PA premier arrived in the Hamas-controlled enclave earlier in the day for a cabinet meeting. But it made clear there would be no dealing with a Palestinian government including Hamas unless or until the terror group recognizes Israel and renounces terrorism. ‘“We expect anyone talking about a peace process to recognize Israel and, of course, recognize a Jewish state, and we won’t accept faux reconciliations in which the Palestinian side reconciles at the expense of our existence,” Netanyahu said during a special Likud faction meeting in the West Bank city of Ma’ale Adumim. In other words, with both the US envoy and the Israeli prime minister stating that any Palestinian government must recognise Israel and reject terrorism, the two countries’ responses to the prospect of a Palestinian government are far less different than Bateman would obviously have his audience believe. The report continued with Bateman failing to clarify to audiences why Hamas’ designation as a terrorist organisation and its continuing refusal to reject terror is a significant part of this story. Once again BBC audiences did not hear a proper explanation of why existing agreements between Israel and the Palestinians mean that Hamas must be disarmed before becoming part of any Palestinian government. As was the case in previous reports on this story, that means that audiences are not receiving the full range of information necessary for its proper understanding. On October 2nd an article headlined “Palestinian PM in rare Gaza visit as rift with Hamas eases” appeared on the BBC News website’s Middle East page. “The Palestinian prime minister has appealed for unity at the start of a rare trip to Gaza, as part of efforts to end a rift between Fatah and Hamas. “Despite the rapprochement between Hamas and Fatah, a number of issues are yet to be resolved. Since the BBC last reported on this story in September, a senior Hamas official has made statements relating to the issue of Hamas disarmament. Despite its previous enthusiastic coverage of the prospect of a Hamas-Fatah unity government, the BBC has not since reported Abu Marzouk’s statements. In a recent interview with Egyptian media, however, the PA president clarified that the issue of Hamas disarmament is a deal breaker. Hamas, however, has said that it will not even broach the subject of dismantling its vast military wing during negotiations, leading some to believe the group was seeking to follow in the footsteps of the Lebanese terror group Hezbollah, which is part of the government but retains its own army. “Abbas noted that Hamas is still an “Islamist group,” while Fatah is a secular party. However, he said, the terror group still constitutes a “part of the Palestinian people,” and would be included in a Palestinian government as long as it agrees to uphold the policies of the Palestine Liberation Organization, which is the largest Palestinian umbrella group. Abbas is the head of the PLO. …Greenblatt reiterated the so-called Quartet Principles that the terror group must meet in order for a government it sits in to receive diplomatic recognition. In other words, the failure of a Palestinian Authority unity government to disarm all Hamas’ armed personnel (including its terrorist militia) would constitute a breach of one of those “previous agreements” – as both Mahmoud Abbas and Jason Greenblatt obviously appreciate. Yet again the BBC’s superficial reporting on a potential Hamas-Fatah reconciliation falls far short of providing its funding public with comprehensive information needed to properly understand the story. In both those reports it was suggested that Hamdallah’s resignation might have some sort of detrimental effect upon attempts to restart negotiations between Israel and the PA. In fact, as was pointed out by veteran journalist Khaled Abu Toameh when the BBC and others made similar suggestions in the wake of Salam Fayyad’s resignation in April, Hamdallah – like his predecessor – was highly unlikely to have had any influence whatsoever in that sphere. 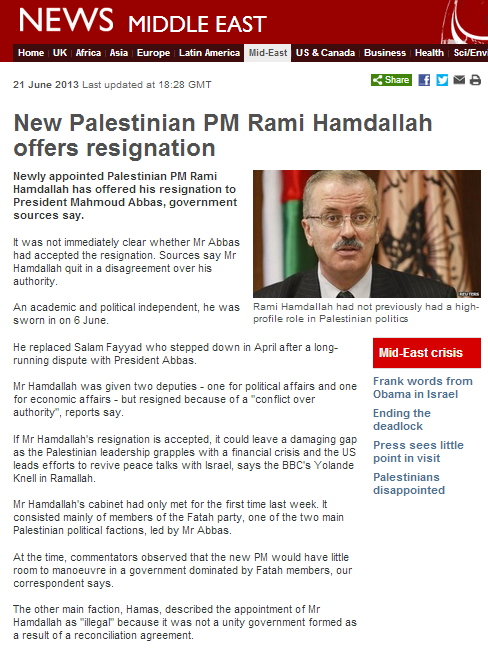 Despite the BBC’s apparent confidence in the claims of unnamed “officials” who insisted that Hamdallah had withdrawn his resignation, other sources seemed to suggest that things were far from cut and dried. 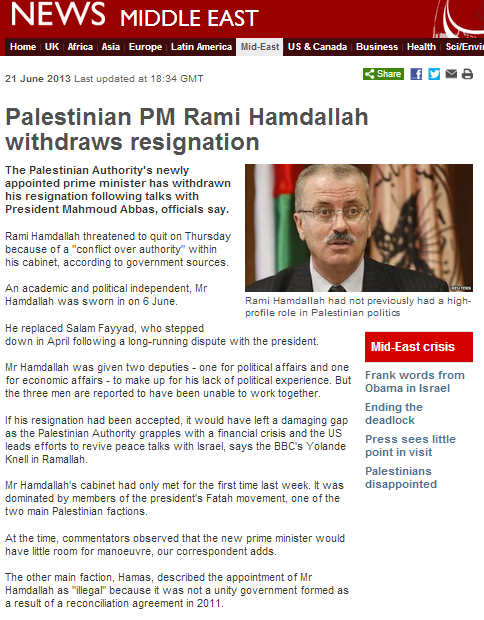 And indeed, on June 23rd it became clear that Hamdallah was standing by his resignation. 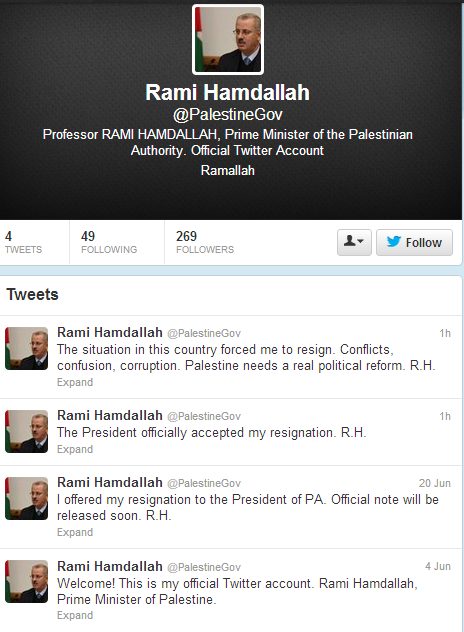 Mr Hamdallah will apparently stay on as head of a caretaker government until a replacement is found. In the meantime, the final message of his equally short-lived venture into social media might perhaps give the BBC inspiration for some real investigative reporting which could bring valuable information and insights to BBC audiences. 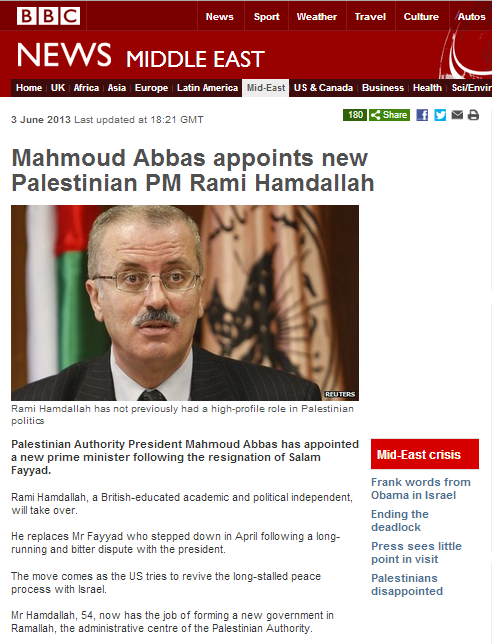 An article appearing on the BBC News website on June 3rd 2013 relates to the appointment of a new Palestinian Authority prime minister. Other media organisations, including Al Jazeera, the Huffington Post and Le Monde as well as the Palestinian site IMEMC (run by the ISM affiliated ‘Palestinian Centre for the Rapprochement between People), state that Hamdallah is actually a member of Fatah, but seeing as he was personally appointed by the PA’s president (whose own elected term of office expired well over four years ago) rather than elected by the Palestinian people, the subject of Hamdallah’s ‘political independence’ is somewhat academic. What is certainly the case however is that Hamdallah’s proximity to Fatah is close enough to have made him Mahmoud Abbas’ preferred choice for the position – the reasons for which are outlined here and here by Khaled Abu Toameh. 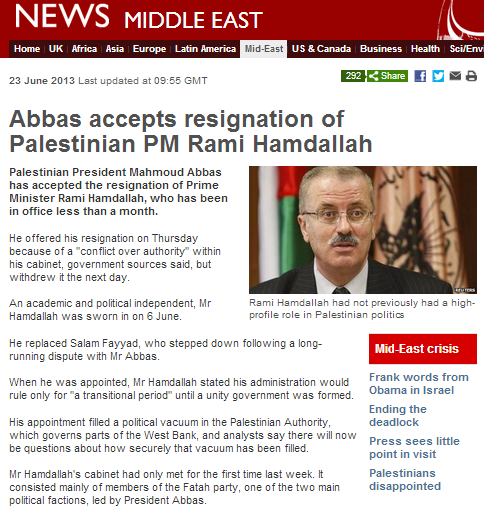 The BBC article is somewhat economic with its descriptions of Mr Hamdallah’s CV. It elects to ignore, for example, his trusteeship and board membership at the ‘Yasser Arafat Foundation’ – the organization which has invested much energy in promoting the conspiracy theory whereby Arafat was supposedly poisoned by Israel. 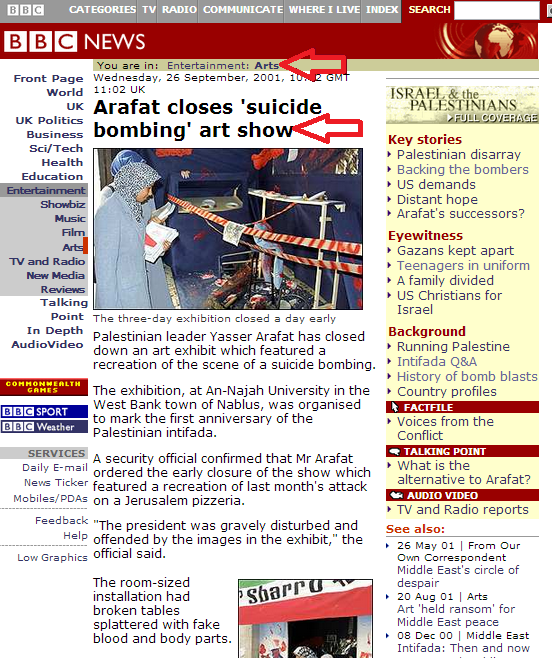 The BBC also chooses to ignore the fact that under Hamdallah’s presidency, students at An Najar University staged an exhibition glorifying suicide bombers in September 2001 (described by the BBC at the time as an “art show” in a report placed in its website’s “entertainment: arts” section) which included a gory representation of the Sbarro pizza restaurant where fifteen civilians – many of them women and children – had been murdered only six weeks previously. It would of course contribute vastly to the BBC’s adherence to its defined ‘public purpose’ of promoting “global outlook” were it to desist from the practice of softening portrayals of the Palestinian leadership – and a new prime minister is a good place to begin.